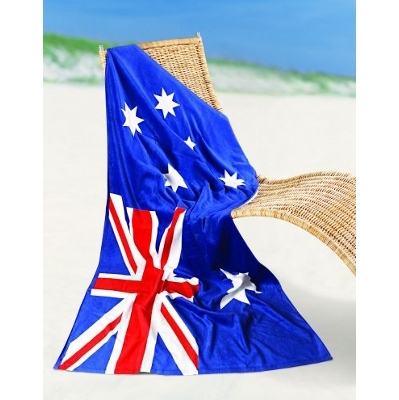 Australian Flag Design on a Large Velour fibre reactive Printed Beach towel 75 x 150cm, 350gm2 Perfect for Australia Day promos. Materials: 100% cotton velour. Item Size: 75 x 150cm. Packaging: single poly bag. Colours: Red/White/Blue.